Pope Francis honored the 100th anniversary of the slaughter of Armenians by Ottoman Turks and called it “the first genocide of the 20th century.” His comments have angered Turkey, which has recalled its Vatican envoy. At Sunday’s mass in the Armenian Catholic rite at Peter’s Basilica the Pope said he had a duty to honor the innocent men, women, children, priests and bishops who were murdered by the Ottoman Turks. He said that humanity had lived through three periods of massive and unprecedented tragedy in the 20th century. “The first, which is widely considered ‘the first genocide of the 20th century’, struck your own Armenian people,” he said. Scholars and historians estimate that as many as 1.5 million Armenians were killed by Ottoman Turks around the time of the First World War. Turkey accepts that many Christian Armenians died in fighting with Muslim Ottoman soldiers at the beginning of 1915, but says the numbers are massively inflated and that they were killed in war. Ankara has recalled its ambassador to the Vatican for consultation, according to a statement from the Turkish Foreign Ministry. It has also summoned the Vatican ambassador over Pope Francis’ comments. Reuters cited a Turkish official as saying that the comments have caused “a problem of trust” in relations with the Vatican. Unsurprisingly, the Pope’s comments were welcomed in Armenia. “We are deeply grateful to His Holiness Pope Francis for the idea of this unprecedented liturgy, which symbolizes our solidarity with the people of the Christian world,” Armenian President Serzh Sargsyan said in a speech in the Vatican on Saturday evening. The head of the Armenian Apostolic Church’s Holy See of Cilicia, Aram I, also thanked Pope Francis for his clear stance on what he called a crime against humanity. “International law spells out clearly that condemnation, recognition and reparation of a genocide are closely interconnected,” Aram said at the end of the mass to huge applause. Francis is not the first pontiff to call the slaughter in Armenia a genocide, as in 2001 St John Paul II also called the deaths the first genocide of the 20th century in a joint declaration with Karenkin II, the leader of the Armenian church. 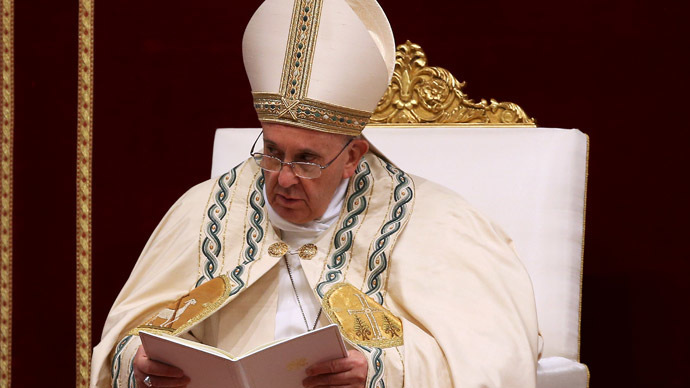 But Pope Francis’ comments again show that he is willing to take diplomatic risks for issues he feels strongly about. In 2014, he invited the Israeli and Palestinian presidents to pray together for peace at the Vatican. He has also spoken out about the Holocaust and Stalinism as well as the genocides in Cambodia, Rwanda, Burundi and Bosnia and more recently has condemned the Islamic State insurgents who have persecuted Shia Muslims, Christians and anyone else who does not share their ultra-radical brand of Sunni Islam.